As much as I love Maine, I really do hope to make Israel my permanent home someday. As such, I try to follow not only the news, but various aliyah information sites, forums, etc. that keep me current on day-to-day life in Israel. This rather snide remark really disturbed me. It touched so many (personal) buttons. When you make aliyah, it’s a big deal. You feel like you are part of Greater Destiny (and you are! ), and by golly, now that you’ve finally made it, you just simply cannot understand why everyone else in the Diaspora can’t make that commitment too! And why aren’t more Americans rabbis jumping on the aliyah bandwagon; why are they talking the talk (if they talk about it at all) but not walking the walk? I know that feeling, because I once felt that way myself . . . until . . . we couldn’t live in Israel anymore. We returned to the U.S. after 5 1/2 years of living in Israel, feeling sad and ashamed that it just didn’t work out for us. The reasons for our failure are irrelevant for the purpose of this blog-post. But it also gave us an insight that we didn’t have before. We realized that there are many reasons that it may not be possible for someone to live in Israel, and we simply do not see or know the huge multitude of factors in another person’s life that may inhibit someone from making aliyah right now or staying in Israel. We dare not judge. And yes, that includes not judging rabbis of Diaspora congregations who don’t personally hop on the next Nefesh B’Nefesh aliyah flight to Israel. Despite the fact that for whatever reason they cannot make aliyah within a certain time frame (and also may not wish to share the reason for that impediment), they can still be a tremendous influence and catalyst in encouraging members of their congregation to make aliyah. So I replied, expressing my dismay at the original post’s comment. Oh, I thought about ignoring it: but this was the honor of a truly good man – the rabbi! – – that was besmirched. I could not let it go! Of course a flurry of comments escalated in response to mine. And I got more and more upset, the more I read and the more I thought about it. And boy, did I think about it – I was consumed with thinking about it. I was putting all sorts of negative energy into thinking about it, and a lot of energy was being drained from my very soul. And that’s when I stopped. I realized, it doesn’t matter who is right and who is wrong. If I was really worried about the honor of the rabbi, how might I have framed my comment differently so the writer of the original comment would not have been so defensive? Perhaps her comment was inappropriate – but mine only added fuel to her fire. In doing so, she got angry , I got angry; now there is machlokes at worst and ill will and discomfort at best. And the timing! Now we’re in the Nine Days, commemorating the destruction of our Holy Temple; not because we Jews were bad or evil people, but because we simply couldn’t get along. Shame on me! Should I have just let her comment go, without response? I should not have expressed my distaste for her original comment; instead I should have focused solely on the positive aspects of the rabbi’s good works. Look at the cost of a verbal misstep! It has the potential not only to destroy relationships – it can destroy worlds! Is it not ironic that here I am, living in the remote Maine woods far away from a Jewish community, and I still managed to get into a disagreement with another Jew, someone who I have never even personally met?! So . . . I am truly sorry I misspoke. Too often passion – – no matter how well-meaning – – gets us into trouble because we act first, and think second. It is the reason we continue to observe Tisha B’Av and the destruction of our Temple, instead of celebrating its rebirth. We repeat the cycle of machlokes ad infinitum; we prove time and again that we are our own worst enemy. I hope to use the remaining period of the Nine Days to reflect on this, so that my aveirah (sin) of sinas chinam and squabbling can be proactively transformed into an act of ahavas chinam (love given with generous spirit). May we merit Redemption through our positive actions, so that next year Tisha B’Av will be celebrated as a Yom Tov (joyous holiday) in Yerushalayim HaB’nuyah. Yogurt and Sprouts: Am I turning into a Granola Head? 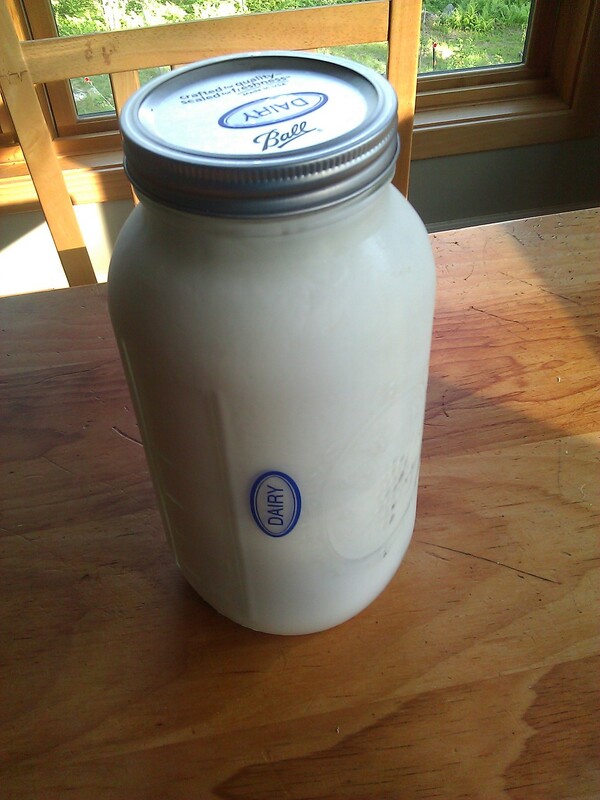 Fresh yogurt I made from goat’s milk. Tastes amazing when you mix 2/3 c. yogurt with a couple of spoonfuls of raw oatmeal, 1/4 c. of fresh blueberries, and a fresh diced peach, nectarine or strawberries! For the past few weeks I’ve been experimenting with yogurt-making. Oddly, I found that I couldn’t get the yogurt to “take” when I went back to my hometown, even though I made it the same way as I do in Maine – – or so I thought. I finally realized that a growing yogurt culture’s worst enemy is air conditioning. Thanks to a/c, the room temperature in my hometown’s house was simply too cold to get the yogurt to develop, and I was left with a thinner texture like kefir in the best of cases, and sour milk when it really went wonky. I don’t have air conditioning in my house in Maine; it’s hard to justify the expense and electricity usage of a/c for the 8 total days a year when it’s really hot. Some days it doesn’t get even hot enough for the yogurt to set on our screen porch. That’s when I park my car in the sun and put the yogurt in the back of our Subaru for 8 hours. That really does the trick, and the yogurt comes out perfectly – – silky smooth, creamy, rich, and barely tart. Now that I’ve “mastered” yogurt, I’ve decided to move on to sprouts. Sprouts have all sorts of wonderful properties. Since they are grown indoors, without soil, they are not weather-dependent and they aren’t messy. You don’t have to worry about insect infestation, since they are grown in a mason jar (the lid is capped with either screen material or cheesecloth). You can make small batches at a time (1 – 2 tablespoons of alfalfa or radish seeds goes a long way). Nutritionally speaking, a cup of alfalfa sprouts has only 25 calories and contains 3 grams of protein, 11% daily requirement of Vitamin C and 4% daily requirement of iron. Radish sprouts have 57 calories per cup but nearly 25% the RDA of Vitamin C. And the organic seeds are cheap. They taste great in wraps or sandwiches. I simply typed in “how to grow sprouts” on both Google and YouTube and came up with several good instructional webpages and videos. 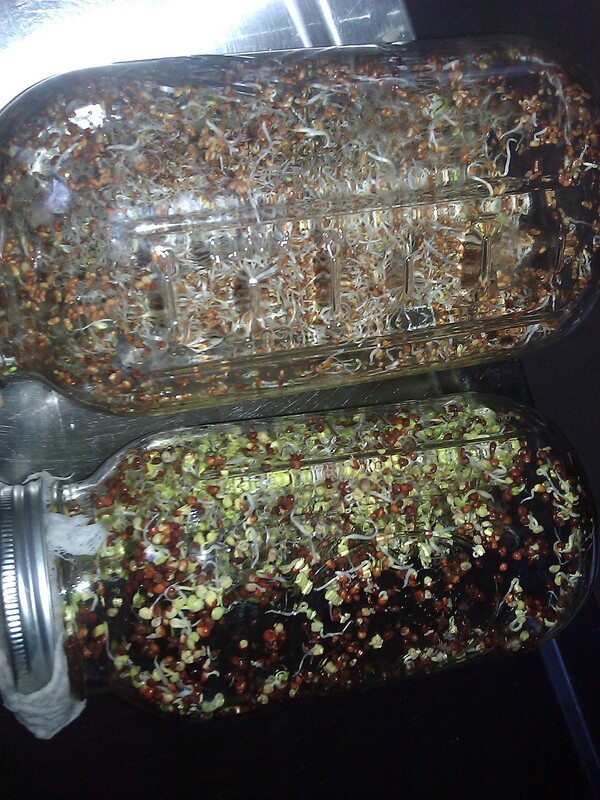 My sprouts, growing in mason jars. Top is alfalfa, bottom is radish. Unfortunately I had not read about the threat of sprout food poisoning until well after I had tasted my radish and alfalfa sprouts. Thankfully I didn’t die. I didn’t even get sick. And they were quite tasty! Did I just get lucky? Any epidemiologists out there who might want to weigh in on the advisability of growing and consuming one’s own sprouts? P.S. More than 13 years ago, I once really did almost kill my four children and my brand-new son-in-law with salmonella poisoning (not from sprouts), but that’s another story for another day. Another view of the sprouts. This is 3. 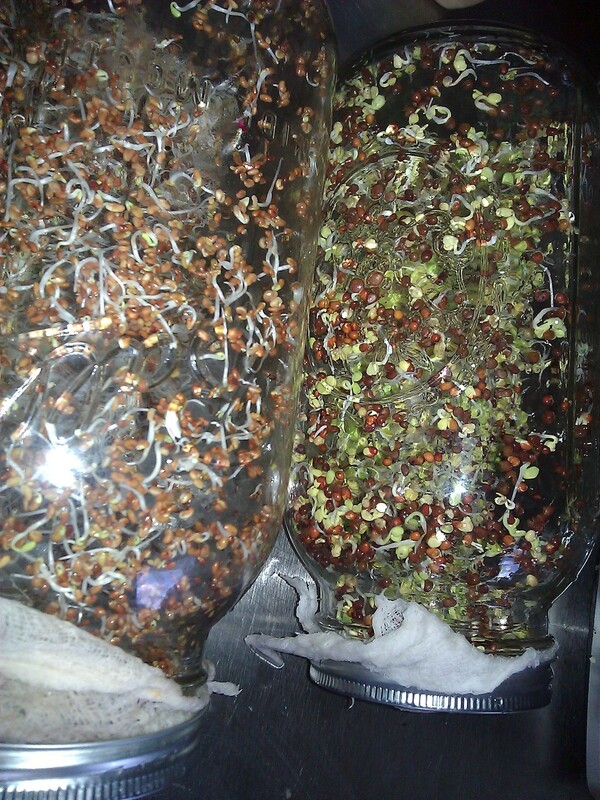 I will harvest them on day 4 (the radish sprouts) and day 5 (the alfalfa sprouts). Close-up: alfalfa on the left, radish on the right. 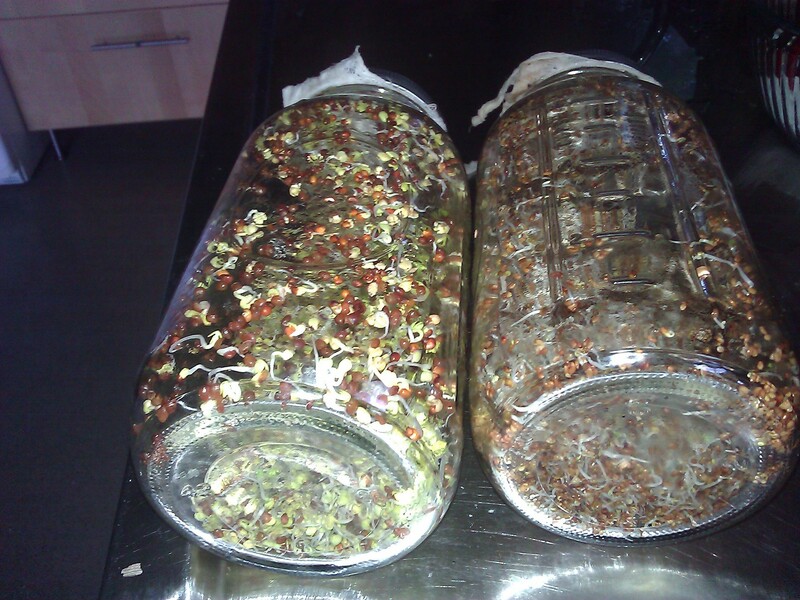 The mason jar lids have cheesecloth to allow for good drainage. I swish them with fresh water and drain 2x a day, every day. Due to cutbacks by the United States Postal Service, our local post office has dramatically reduced its hours. Now it’s open for transactions only M-F from 7:30 a.m. – 9:30 a.m, and 2:15 pm – 4:15 p.m. in the afternoons. The post office delivery truck drops off the mail around 8:30 a.m., and it’s placed in PO boxes around 9 a.m., so the window to get one’s daily mail in the morning is very narrow indeed. The lobby without counter service is open during the middle part of the day if you have a post office box, but if you get a notice in your box that a package has arrived and you aren’t there during counter service times – – too bad. You must return during one of the two-hour windows to claim your package. It gets worse: the routes of both FedEx and UPS work out so that they arrive at the post office between 12:30 – 1:30 pm, when the post office is closed, so packages headed to the post office cannot be delivered or redeemed if they are being delivered to your post office box as an address. A solution to this problem would be for UPS and FedEx to place a delivery box outside, so the postmaster could access it during open hours, but UPS and FedEx have so far been uninterested in doing so. It is very likely that in the next 2 years, our local post office branch will cease operating altogether. I try to coordinate a visit to the post office with our transfer station – – also known as the garbage dump — which is open Tuesdays and Thursdays from 1 – 4. We have no trash pickup here – all self-generated refuse must be taken to the dump in our car. The post office is 6 miles away and the dump is another 2.5 miles further up the road, and what with the cost of gas nowadays, I try to limit my visits. Also on Tuesdays, our tiny library is open from 5 pm – 7 pm (the other day is Shabbat, so I can’t visit then). It’s a 3-mile trip one way from home to the library but it’s on the way to the post office and dump, so I try to stop by the library on the way home. Still, I do have time to kill from the post office closure at 4:15 to the library’s opening time of 5 p.m. So yesterday I stopped by the lake. I couldn’t go swimming or kayaking due to it being the Nine Days (leading up to Tisha B’Av), but I was content to sit there and watch a 5-year-old boy fishing with his father. The look of joy on the little boy’s face when he caught a fish (as well as the proud dad’s) was priceless, and I never tire of the serene view of the lake, clouds, and surrounding mountains, and the quiet. Suddenly a minivan with Illinois license plates turned into the parking area, and a married couple with 2 preteen daughters stepped out and started taking pictures of the beautiful view. I couldn’t resist asking if they were from Chicago – – one of my daughters lives there and I will be going there to visit next week. “No, we rented this car from New York,” the man replied. “We are from Denmark. We are doing a driving tour of the eastern United States.” He explained that one of his daughters had hurt her ankle, and as a result they had to cancel many of their planned activities for the day. They were limiting themselves to sightseeing from the car on this day, and had driven about 90 miles from western New Hampshire, extemporaneously wandering the scenic mountain roads. He had many questions about what there was to see in this part of Maine, as well as questions about Maine culture, the people, the lifestyle, etc. Well, I had nothing better to do until the library opened . . .
As we chatted, I made several suggestions of places they could visit nearby that were off the beaten track and were known only to locals. “You won’t find these suggestions in any tour book,” I said, “but if you love nature, you won’t want to miss them.” Still, I realized that many of the places lacked signage and were accessed by hidden dirt or gravel roads, and he was unlikely to find them based on my directions alone. I guess I looked trustworthy, because they were game. I had a great time taking them all over the place – – I probably used up $20 out-of-pocket in gas. I would stop my car every so often and they’d pull up behind me. “Look – here are some moose hoof-prints!” I’d point out. Or, “Check carefully along the road – last year at this time I saw a bear cub foraging here for blueberries.” And: “This little library was a one-room schoolhouse from the 1800s until 1963. Now it’s used as a library, and the author Stephen King, who lives nearby, helps to fund it.” And: “This area used to be a heavily forested valley, until 1983, when a severe storm with 100-mph winds created a blow-down. The entire forest was destroyed. Then the beavers took over, and gradually the dammed area became the desolate bog you are looking at now. Isn’t the power of nature amazing?” I also took them to a hidden glen with a beautiful stream and small waterfalls. “Salmon spawn here in November!” I gushed. They were impressed! Again and again, they thanked me profusely at each new stop for being able to see things and learn things that would otherwise not have been possible. Together we ended up spending about 90 minutes touring the area. We developed quite a rapport. I discussed everything from logging and woodsmen, to moose and bear hunting, hiking, fishing, locals’ acceptance of strangers, politics, racism (the lack thereof), local education and jobs, cuisine, odd Maine laws – – you name it. I said that the motto of Maine should be “live and let live,” since people are quite accepting of letting people do their own thing, as long as they don’t try to stuff their personal agenda down another’s throat. “Oh, you mean everyone in Maine is very liberal!” the man exclaimed with glee. “Well, I guess that depends on how you’d define ‘liberal,'” I replied. “I mean, just about everyone here owns a gun,” I said. The poor man’s eyes grew wide as saucers. Then I realized: who knows what they were thinking as I led them with my car through narrow mountain passes, through pocked and pitted gravel roads, through forest lanes so laden with foliage that you needed headlights to turn the shadows back into daylight, in places where no other people or buildings were in sight? And now that I had said that everyone in rural Maine owns a gun, they probably felt like they were in a replay of “Deliverance,” only I was the one who could have been the bad guy! Alas, it was now 6 p.m. and I still hadn’t made it to the library. I recommended yet another isolated mountain road that would ultimately lead them back to their point of origin in New Hampshire, and after ensuring that their GPS recognized my suggested route, we wished one another well and said our goodbyes. I don’t know what made me offer this impromptu goodwill tour to a family of complete strangers from a distant land. I know they loved it – – they told me so, repeatedly, and remarked many times how fortunate I was to live in such a place. But I confess, I do not know who enjoyed it more: I had a wonderful time sharing the beauty and lore of my surroundings, and making my experiences a part of their experience, however vicariously or fleetingly. Amazingly, after we parted, I realized that neither of us had told one another our names! It wasn’t the Yosemite sunsets that had filled me with such hale energy as a child, it was watching those sunsets with my family, the four of us huddled together, windbreaker against windbreaker. It wasn’t the close clarity of the stars, but Mom pointing out the Milky Way, that gave me the vertiginous feeling of falling into the vast heart of our galaxy. It was not only the place that mattered, but the fact that in that place the family was together and uninterrupted. I’d gone looking for Eden in the places where human fingerprints disappeared, but paradise was empty without the human touch. Immediately upon completion of the 30-day mourning period for my brother-in-law (shloshim), we returned to Maine from our home town, driving 10.5 hours through the night. We arrived at 7 a.m. on July 4th. The first thing I noticed was the holes in the driveway. In June, a snapping turtle had been busy sloooowly coming up the driveway each day at dusk for about a week to dig a hole, lay some eggs which resemble ping-pong balls, cover up the hole, and sloooowly make her way back to the bog at the bottom of the driveway. 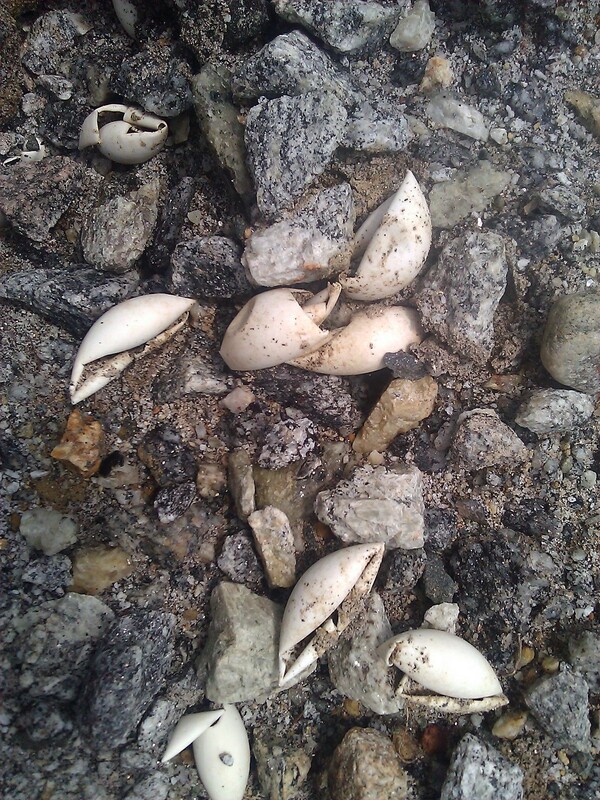 Now, in July, the eggs must have hatched in the past 2 days, for the shells were still leathery. The baby turtles had torn their eggs open under the ground, and literally clawed their way to freedom digging through the packed gravel on the driveway, making their instinctual pilgrimage to the bog below. It’s quite a miraculous journey, as many local creatures such as raccoons, fishers, herons, hawks, crows and snakes prey upon the babies, or manage to dig their way underground to steal and eat the eggs from the nest before they hatch. Once grown, though, the snapping turtle has only man for a predator (you’ve probably heard of Turtle Soup, a real delicacy in China). When threatened the snapping turtle’s bite is powerful and could amputate someone’s fingers. Leathery remnants of hatched snapping turtle eggs. 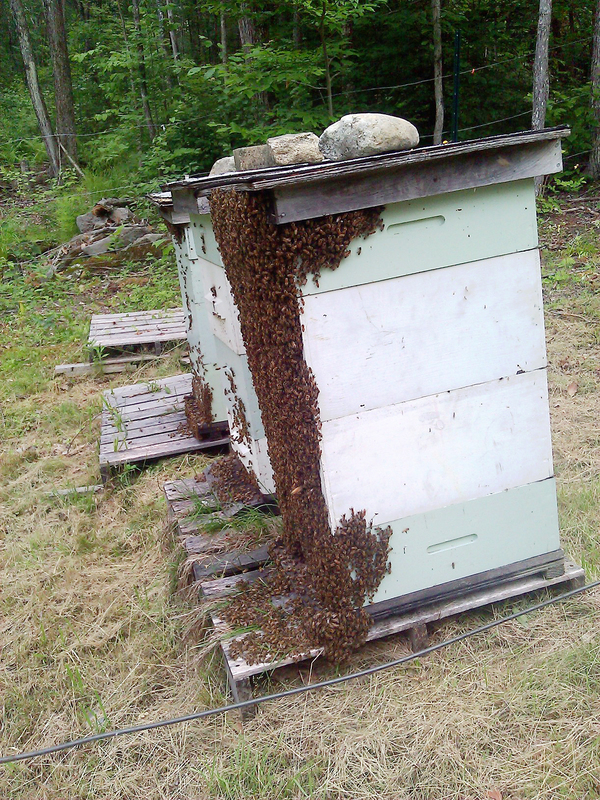 Bearding is a form of hive air-conditioning; the bees depart the immediate brood nest area in order to help keep it at the desired temperature (too many busy bee bodies = too many BTUs). When you see all the bees outside the hive an hour before sundown, you’ll also notice the following morning (early a.m.), most if not all, have gone back inside the hive because the outside air temperature (and thus the hive temp) has dropped – again, just a way they regulate the brood nest temperature. While we were away, it had rained 10 of the last 15 days, and the first two weeks of June were scarcely drier. Our house was practically unrecognizable upon our return, due to the heavy foliage. The lilac bushes and blueberry shrubs I had planted with such care, along with 80 sunflower plants, had been swallowed up and overwhelmed by weeds, brush, grass, thorny raspberry and poison oak. The trunks of the apple trees were similarly covered. In the Maine woods, in the battle of Man vs. Nature, nature ultimately always wins. (Or as a Mainuh once bemoaned the state’s poor economy, “The only thing Maine knows how to do right is grow trees and lobstah.”) Weed-whacking was the order of the day (not the most ideal way to spend a holiday day off), and it was made worse by a searing heat wave that included lots of humidity. Once the orchard was trimmed, I could see that the garlic had really grown tall. The type of garlic I planted is not like the kind you get at the supermarket. In order to survive the Maine winter (garlic is usually planted in the Fall), a special type of garlic, called hard-necked garlic, is used. Although its strands cannot be braided due to the stiffness of the greens, it is very potent and delicious. Towards the end of the growing season, each planted clove forms a curly “scape” with its own little seed bulb. 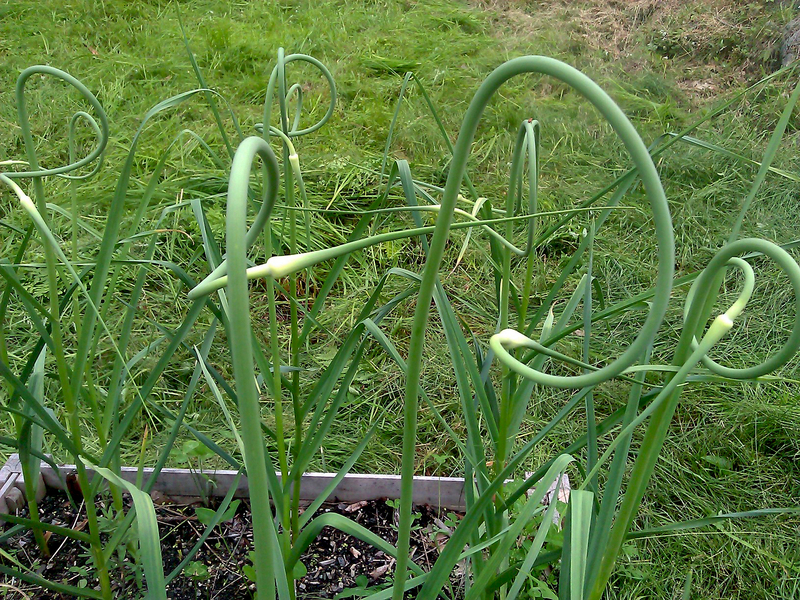 It is recommended that one cut the scapes off so the garlic bulb under the ground will not divert its nutrients towards the scape, and the bulbs will reach their maximum potential in size. But the scape cuttings can be used to garnish a salad or sautéed or steamed, and are quite delicious in their own right. My husband was completely exhausted after doing the weed-whacking, and had lost probably 5 lbs. in sweat (eeyew). We jumped in the car and drove to the lake, which was completely devoid of other people, and dove in the cool, clean, refreshing water. We had a great swim! From there we returned home, had a light dinner, and decided to go see fireworks. Fourth of July celebrations are taken very seriously and enthusiastically in rural Maine. In especially small towns, two or three towns will combine their celebrations and have several events during the day, including a parade (which most of the residents participate in, so there are few spectators), a 5k charity race, a pot-luck picnic lunch or dinner, with proceeds also going to charity, and of course, fireworks. What made it really special, however, was the crowd of 150 people of all ages. When the fireworks began, the entire audience spontaneously started singing a whole medley of patriotic songs, including the Star Spangled Banner, God Bless America, and This Land is Your Land. It was really quite touching, not to mention patriotic. I guess the patriotism is not that surprising, since most of the residents here are direct descendants of the original patriots, colonists, and founding fathers who created the United States of America. This is their heritage at the source and by golly, they certainly do embrace and celebrate it. Today, Sunday, is the last day before the 9 days leading to the Tisha B’Av fast day and prayers, which commemorate the destruction of the Holy Temple in Jerusalem. During these upcoming nine days there are several restrictions. No swimming or boating. No laundering. No eating meat. So naturally, in between scrambling to get all my laundry done, I made kayaking, fishing and swimming a priority, since I cannot partake of these activities after today. I did manage to catch several fish: 2 small yellow perch (not known as good eating fish so I threw them back), a brown trout which was too small to keep and also was returned to the water, and finally, a nice-sized white perch, which, when sauteed with the garlic scapes mentioned above and some freshly-snipped parsley that is also from my garden, made a tasty and healthy lunch. 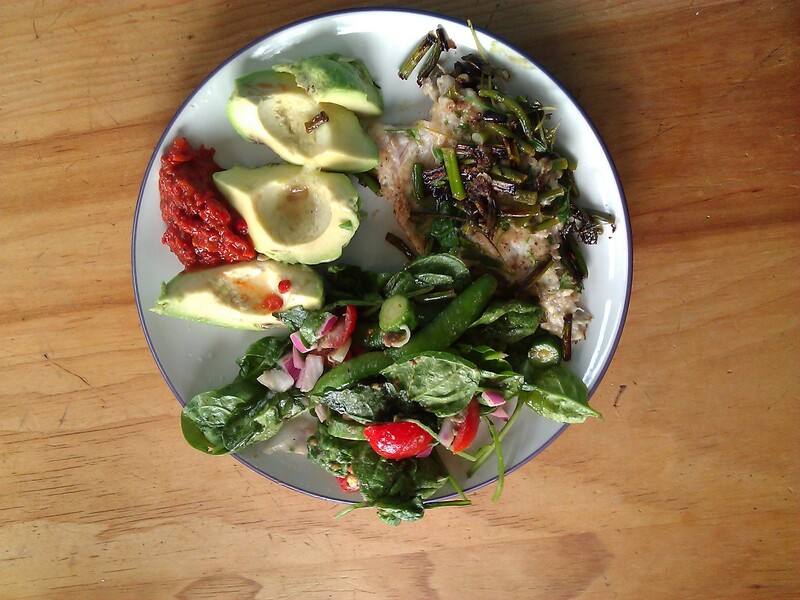 2 o’clock: just-caught white perch sauteed with freshly picked parsley and garlic scapes from my garden. By being away from Maine during the crucial month of June, I missed the prime planting time for a summer or fall garden. So my packets of many varieties of kale seeds and beets and cucumbers will sadly have to wait until next year to be planted. Because frost appears as early as September in Maine, the growing season is very short, and if you do not seize the day to plant in a timely manner, you simply lose out until next year. It is good to be back! And this will be a busy summer: awaiting the birth of a new grandchild in Chicago, and entertaining eleven of my grandchildren at the same time in mid-August here at our house in Maine. Stay tuned!